When Yuval Zaliouk was growing up, his grandma Dina would make a wonderful dry cookie she called “Petit Gateau Sec”. This little addictive cookie was full of almond and raisin flavor and everyone loved them. Long after his grandma’s death, Yuval Zaliouk decided to make and sell the cookies for those who were searching for something that was healthy and taste good too. Thus Almondina was born, and it carried grandma Dina’s name too. The original Almondina has to be my favorite. It has very simple ingredients: Almonds, flour, pure cane sugar, egg whites, natural flavors, and Kosher Pareve. The ingredients are so simple, and they are AMAZING!! Almondia’s mission is “To put a healthful cookie on every table”. Goose loves to eat these as a snack and with lunch, and I don’t feel bad about giving them to her. Just take a look at the Nutrition Facts, not bad. This is a photo of the Gingerspice Almondia cookie. Instead of having raisins, it has diced ginger. So the cookies are full of the all natural flavors of almond and ginger. I personally like to eat these with coffee or tea, but this is the type of cookie that does not require that. The Almondia cookies are thin and crunchy, but not like other unmentionable “cookies” where you think you are going to break your teeth eating them. Another thing I like about the Almondia cookies is, there are no hidden perseveres or junk. Almondia uses all natural ingredients in their cookies. Almondina has come up with some great flavors of these awesome little cookies too. Almondina is letting me give away a sampler pack of these wonderful cookies to one of my awesome followers. Enjoy! 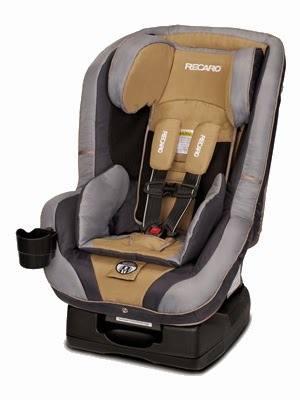 If you are looking for a nice car seat, you should take a look at the RECARO Performance RIDE. This car seat can be used in rear and forward facing positions, and for children 5-70lbs. This carseat gets a 4.3 star review on Amazon, too. Hope you enjoy this giveaway. Welcome to the RECARO Performance RIDE Giveaway! RECARO boasts more than 100 years designing safe and comfortable seats, that they have now brought to child and infant car seats. Featuring side-impact protection, soft touch head restraints (made with PUR memory foam! ), a 5 point harness, Easy Adjust technology and more. Available in 9 color combinations, the RECARO is design, safety and comfort all in one beautiful, comfortable seat. You can find a full review from More Than Mommy. One lucky reader is going to win a RECARO Performance RIDE car seat in the Slate color. Simply enter using the Rafflecopter form below, if you are a resident of the U.S. and 18+. One entrant per household, please! To keep up with new updates from RECARO, check them out on Twitter and Facebook. *This blog has not been compensated to host this giveaway. More Than Mommy received a car seat for review purposes. This giveaway is not associated with Facebook, Twitter, or Pinterest. Challah bread is a traditional Jewish braided bread that is severed on the Sabbath and special holidays. I, personally, am not Jewish, but I love the way this bread looks and tastes. 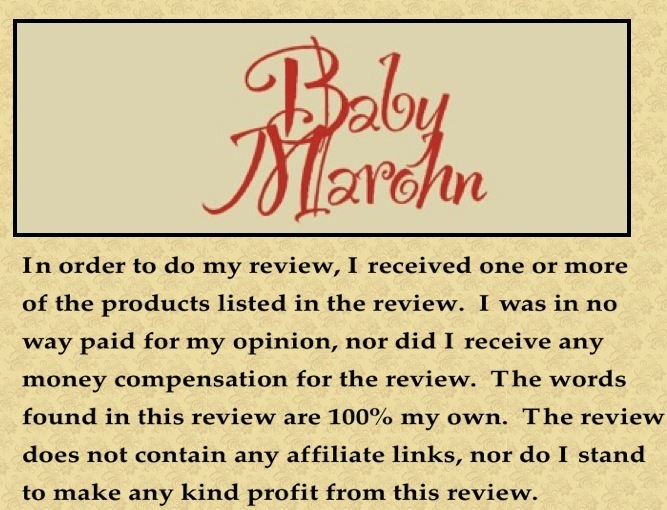 I had never tried to make it until Tribes-A-Dozen contacted me about doing a review. My first thought was, there is no way this is going to turn out, and so I went into this very skeptical. I opened up the box, and found that each kit comes with a flour mixture and a packet of yeast. After I opened the box, I decided to read the directions, and I found that a bread maker can be used with these bread kits!!! Yay, not so hard to make now. I found that using my bread machine, I didn’t need to follow the directions on the back. I just oiled the whole pan and the paddles on the bottom, then poured the warm water, oil, flour mix, and yeast in. I then proceed to beat the egg and extra yoke a little before pouring it in. Then I turned on the bread machine to a quick light crust loaf, and let it do it’s thing. When I made this bread, we were on our way to a Christmas party, I grabbed the loaf out of the machine, and left. I forgot to take a photo of it. It was beautiful though. I didn’t do the braided look, but it was perfect still. I was so pleased. If you are Jewish, you will happy to know that all three kits are kosher, so you can use them for religious purposes. 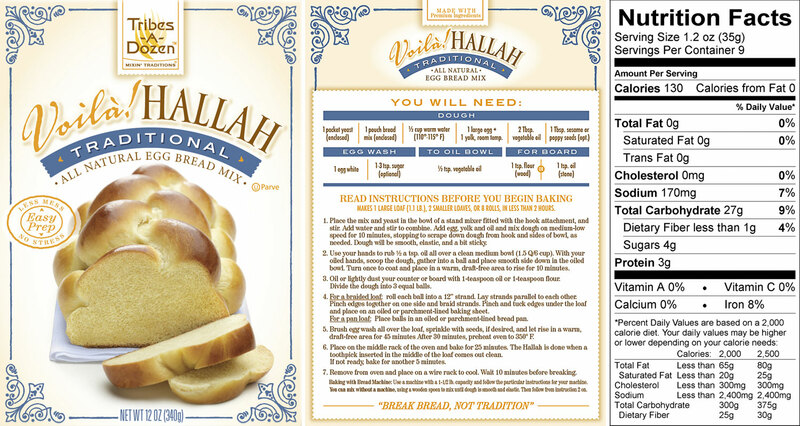 Tribes-A-Dozen Hallah Egg Bread mixes can be found in some stores and online. I looked at my local grocery store, but did not see them. I did use their store locator, and found that Wal-Mart sells them, but I don’t go Wal-Mart, so I cannot personally say that I’ve seen them there. I have seen them on Amazon though. 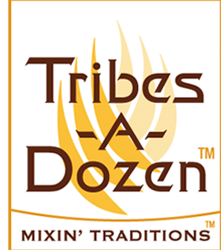 Tribes-A-Dozen is also letting me give one person all three mixes. To enter the giveaway use the form below. When Goose was still in diapers, I felt that every time I didn’t let her bottom air out when changing her diaper, she got diaper rash. I tried all sorts of things, but there are two things I found that helped the most. One, switching to cloth diapers, and two, using a dry cloth to dry her off after the wet wipe. I used several different brands when she was in diapers, but now that she is out, I have found the best ones yet (all ways happens to me, I find the greatest ones after I need them). 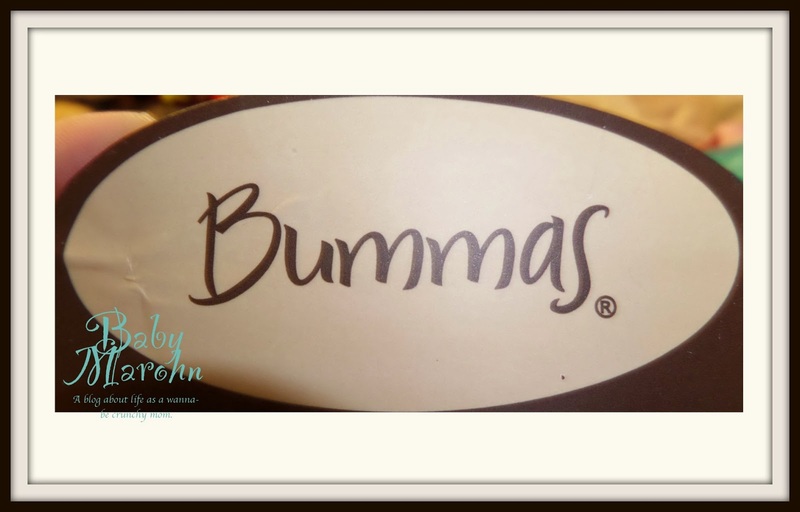 The Bummas cloth wipes can be use for many different things. 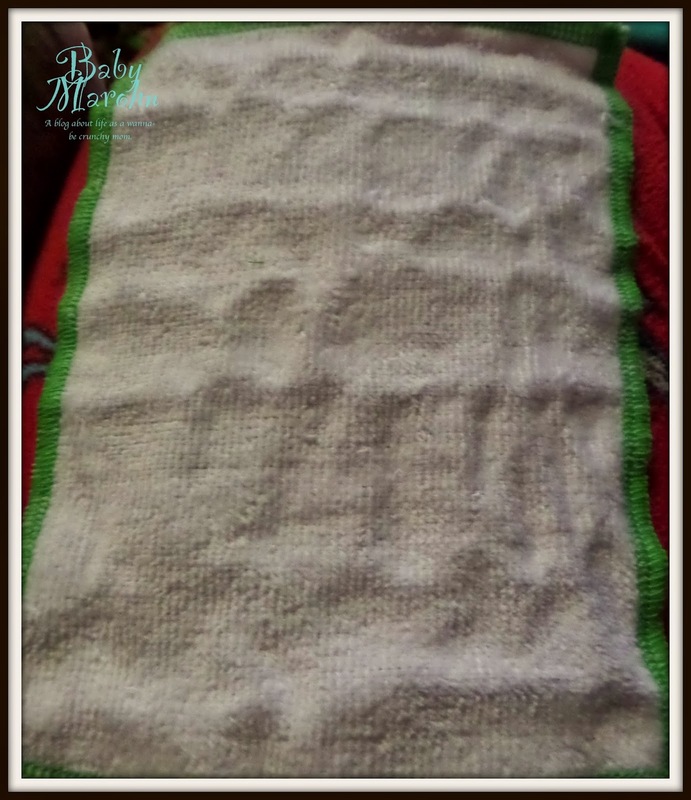 They can be used to dry baby’s bottom, as a wet wipe, a wash cloth, and so much more. (I’ve even used them to clean my glasses and computer screen.) They are small rectangles that measure 5″x7″, and are 100% cotton woven velour terry cloth. The best part is, you just use, wash, and reuse. No more throwing money down the drain with disposable wipes. 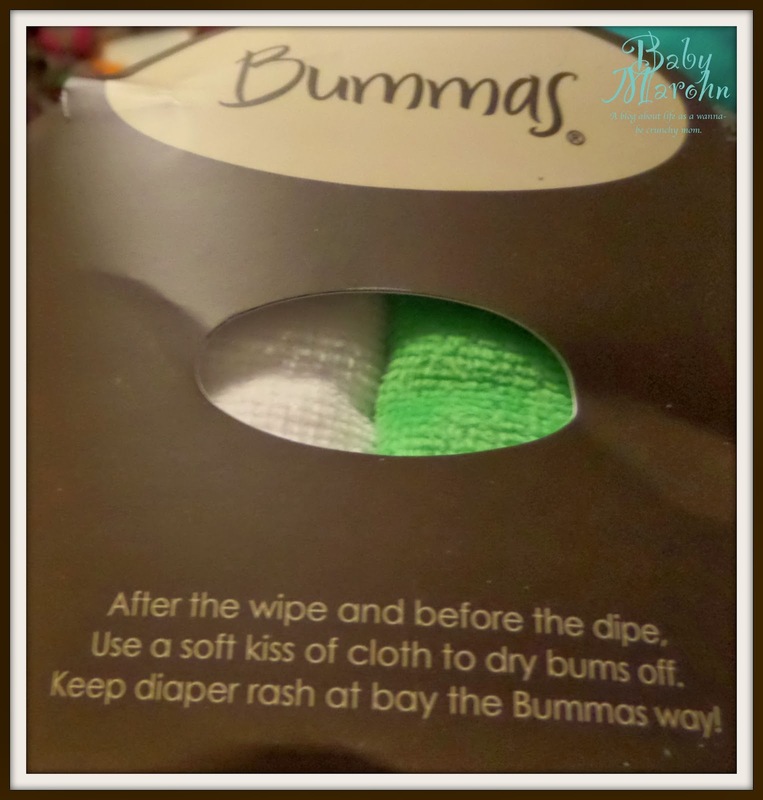 Bummas cloth wipes are really durable and won’t fade, pill, or shrink. Bummas cloth wipes can be purchased online on Bummas’ website (http://www.bummas.com/). They cost $15.00 (+shipping), and come in a bunch of fun colors. I’ve seen them on Amazon too, but Bummas has a better price on their website. The wonderful people over at Bummas are also letting me giveaway a pack of Bummas wipes to one of my awesome readers. Please use the form below to enter. A few months ago we took Goose to the zoo, and they had a booth set up where you could get your face painted, have temporary tattoos applied, and get this really pretty glitter body art done. I really liked the glitter body art, and allowed Goose to get one done. It was cute and lasted almost a week. She went around telling everyone she had a “cutie mark” (Please see “My Little Pony” for definition). The body art was cute, but it also costs $10 for a small little butterfly. So, I, being the type of person I am, got home, I looked up companies who make glitter body art. Turns out Glimmer Body Art was one of the best rated companies I could find, and they make kits for home use. It is the exact same stuff you would get with the professional kit, but in a little more manageable size. The personal sized kits are called Party in a Box. There are five different themed boxes in the line of these kits. The way Glimmer Body Art is applied, is super simple. Pull off the clear plastic that covers the top of the stencil. Brush any extra glitter to the center, and then brush off. I would personally wait a few minutes for the body art to dry, but it should be completely water proof after that. Each tattoo lasts for about 7 days, depending on how you car for it (for example; pat dry don’t rub). If you need/want to remove it before it comes off on its on, just just some alcohol and rub rub rub. (this is my first video, please excuse my rambling and stuff) All in all, I love these! Glimmer Body Art really hooked me up and gave me a few sets of these, and I used them over Christmas with my sister’s kids. They had a blast, and wanted to put them all on. I limited them to four each which gave me plenty of practice. We had so much fun, I plan on having Glimmer Body Art at Goose’s birthday party in a few weeks!If you are interested in getting some of these kits for your self, you can purchase them online here: http://glittertattoosshop.com/collections/glitter-tattoo-kits If you want to purchase the kits individually, they are $20, but if you want to buy all five kits together that is $100 (prices do not include shipping or tax (if applicable)) Glimmer Body Art is also letting me giveaway six prizes. Five winners will receive a single kit, and one lucky person will receive the grand prize of ALL FIVE KITS!! Hi guys! I hope all are staying warm and dry. It’s a cold snowy January day here in our part of the world. I wanted to bring you guys this giveaway, since babywearing is something I hold dear to my heart. It has been a life saver in the past when Goose did not want anything other than to be held. I hope you guys enjoy!! 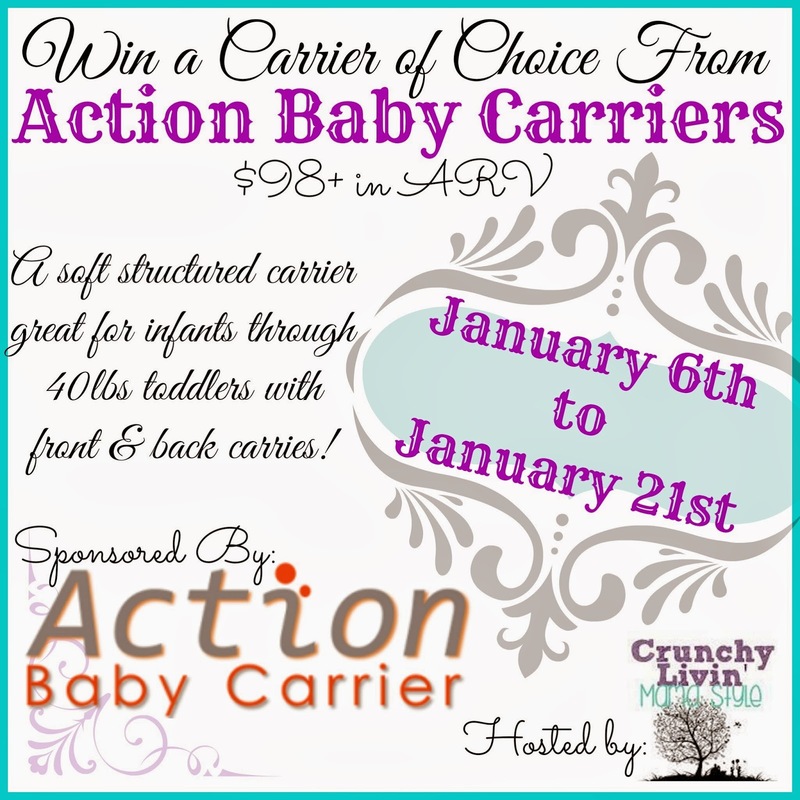 Welcome to the Action Baby Carriers Giveaway! Crunchy Livin Mama Style recieved an Elle Toddler carrier from Action Baby Carrier in exchange for her honest review. This blog has not been compensated in the promotion of this giveaway. Action Baby Carriers is a family operation located in Detroit, Michigan – purchased by a husband and wife team who adored babywearing their own baby. They have since been dedicated to producing high quality, comfortable and extremely useful carriers for other families! Action Baby Carriers are great for many reasons! They’re made in the USA and designed to create the perfect sitting position for your little one for weight displacement and proper positioning of baby’s hips. Not only do they offer great quality carriers, but also allow parents to share special bonding moments with their little one while affordable for families. They currently offer a variety of prints and colors in both their Classic carriers and Toddler carriers. Their carriers have the same webbing; however, the Toddler carrier is 3 inches taller in the body than the Classic carrier while also offering a longer hood. Their Classic carrier as a body width of 13.5″ whereas the Toddler carrier’s ‘seat’ is 19″ cross. The Toddler carrier is also great for your older children as it goes from 15lbs-45lbs over the 40lbs of the Classic carrier. Elle Toddler carrier from Action Baby Carriers! 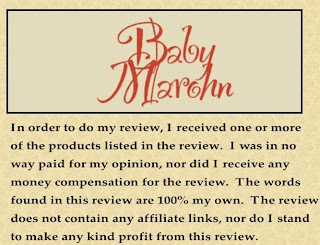 Action Baby Carriers was extremely generous and has also offered a 10% off code for our readers! Valid through January 31st, 2014! 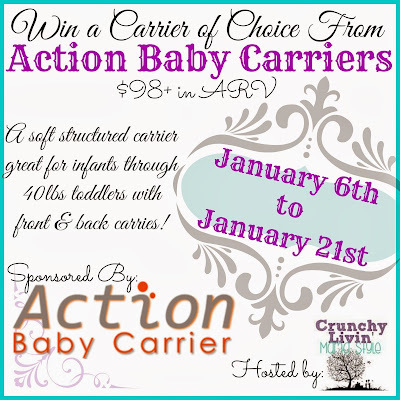 NOW IT’S TIME TO ENTER TO WIN AN ACTION BABY CARRIER FOR YOUR LITTLE ONE! This giveaway will begin January 6th and run through January 21st at 11:59pm. The winner will be chosen at random through Giveaway Tool. The winner E-mailed and given 48 hours to claim their prize. They will then be announced on the Giveaway Tool. The winner will receive the prize shipped to them from Action Baby Carriers. Crunchy Livin Mama Style and any other participating blog is not responsible for prize shipment. Must be 18 years and older. Facebook, Twitter, Pinterest, Instagram and Google are in no way affiliated with this giveaway. No Purchase Necessary. Void where prohibited by law. Open to US residents only. If you are needing a new pair of sunglasses, this would be a great giveaway for you. 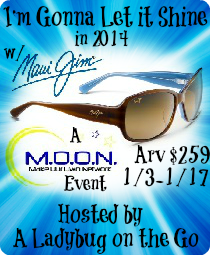 In this giveaway you have the chance to win a pair of Maui Jim Sunglasses. You can enter any time between now and 1/17. Good luck and happy entering! A few months ago I started looking for a way to help block sunlight from the bedroom while my husband slept since he works nights. We got some really fancy black out curtains, but the still let light in on the sides, and really bad on the top. So the search continued. Then I had the opportunity to review the Zeepo strapless mask and the Dream Essence Sleep Serum. I was really excited for hubby to try this out to see if he was able to sleep better. First, you stick four of the adhesive strips to the mask and place them as pictured above. Then pull off the clear portion of the strips so that they are sticky. Then you stick the whole thing to your face making sure it fits well over the bridge of your noes. The mask blocks out the light really well, and you don’t have to worry about it falling down while you are asleep since it’s stuck to your face. The sleep serum also smells great! You just dab a little on your wrist and temples, and the aromatherapy scents will help you relax and soon fall asleep. Also, the wonderful people over at Dream Essentials is letting me giveaway one Strapless Sleep Mask and a trail size of the sleep serum. If you are looking to take some piano lessons, or have a homeschooler who would needs some music lessons, you might want to look into the Hoffman Academy. Hoffman Academy offers online classes that are accessible at any time during they day, so if you have a crazy schedule this might be the perfect program for you. I recently got to try the first unit, and was really impressed. The lessons start out really simple, and cover everything that you would need to know from which direction you go on the keys to make high and low notes, up to some basic chords. Each lesson in the unit come with an instructional video, that can be viewed at anytime on their website for free. The wonderful folks over at Hoffman Academy are also letting me giveaway unit 1 of their lessons to one lucky reader. You may enter any time between now and 1/1/14. Every parent wants the best for their child(ren); I know for Goose, I want her to grow up knowing that she is and will be forever loved. Not every parent knows how to reach that goal for their child(ren). With “How to Raisy a Happy Child (and Be Happy Too), the authors Heather Criswell and Taryn Voget really offer some great suggestions on how to really make your relationship with your child(ren) great. Each chapter of “How to Raise a Happy Child (and be happy too)” starts off with Heather sharing her experiences as a mother, a foster mother, and a child care center teacher and owner. Then at the end of the chapter/section Tayrn follows up and kind of sums everything up so it’s easy to understand. All of the chapters end with a QR code that you can scan with your smart phone. These codes will take you to how-to parenting videos. At the end of the book, Heather offers some scenarios of how to talk to children in a way that they can understand. She even talks about how to deal with a child finding out about Santa Claus. Goose can be a very strong willed child, and to some she may appear to be bratty or spoiled. With this book I am learning to do away with those labels, and learning how to listen to her better (even when she is definitely not listening to me). I think this book is a really great resource, and I plan on keeping it around for a reference guide for a long time. If you would like a copy of “How to Raise a Happy Child (and be happy too)”, you can purchased the paperback version on Amazon for $19.76. You can also try and win a copy until 12/30/13 below.